When you hear the name Bruce Lee, what’s the first thing that comes to your mind? I know, a diehard martial arts freak who’d not hesitate to take the life of anyone who made the mistake of messing with him or his family. Well, although this might be partially true (at least, in the film roles he played), there’s more to Bruce Lee than this: Other than the martial arts badass that he was (and he’s mostly known for), he was also a philosophy badass. From a very young age, Bruce Lee was obsessed with learning how to make the most out of his life. This is reflected by the countless of hours he spent reading books; by the age of 30, he possessed thousands of titles in his library, most of which on self-help, philosophy, and martial arts. But Bruce wasn’t just a man of theory; rather, he was a man of action. Hence, any important lesson he could grasp on an intellectual level, he’d apply it in his everyday life, with martial arts being his main vehicle for doing so. Bruce Lee didn’t see martial arts merely as a competitive sport, but in essence as a means of self-discovery and self-expression. By learning to fight, he was able to better understand who he was — he could force himself out of his comfort zone, test his limits, and confront his fears. Fighting was his way of making friends with his inner demons, expanding his sense of self, and expressing the core of his being. Through his books, films and interviews, Bruce Lee tried to convey the wisdom he had gained over the many years of studying philosophy and practicing martial arts. Here I’m going to share with you seven of his most profound philosophical insights, which, if you give them the attention they deserve, will help awaken your inner warrior — that is, the fighting spirit that will guide you through any hardship in life. So without further ado, let’s jump right into them! 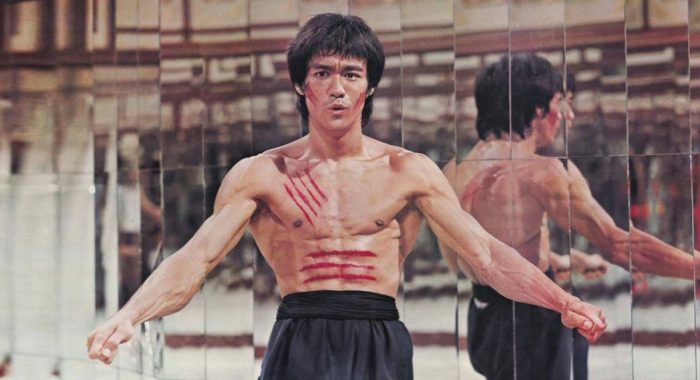 According to Bruce Lee, life is in constant change, and unless we learn to adapt to it, we’re bound to experience tremendous resistance that will entrap us in a constant state of suffering. The scene has Lee on a large junk that is sailing from Hong Kong to an island destination, the locale of a brutal martial arts tournament presided over by Han, the renegade Shaolin Temple monk who has turned to a life of crime. Sensing that his adversary is not to be dissuaded and that some action must be taken, Lee agrees—with the proviso that they not fight aboard the junk. “Don’t you think we need more room?” Lee asks. Just like water, we can learn to overcome any obstacle we find on our path, not by fighting against it, but by embracing it, moving along with it and silently conquering it with the least effort on our part. Kick dogma out of your life. Although learning from others is a necessary part of your psycho-spiritual growth, we’d better not hold tightly to a certain ideology that was handed down to us. A wise teacher knows this very well, and hence doesn’t let his students become his followers; rather, his whole work is to help them break free from the shackles of external authority and create their own path in life. If you think about it, most of us are wasting much of our time on things that don’t truly contribute to our well-being. We do work we don’t enjoy, we buy stuff we don’t need, we spend time with people we don’t like, and so on. No wonder our everyday life has become so complicated and stress-full. By learning to simplify, we can let go of what isn’t serving our happiness and growth, and focus on what actually does. We can unburden our psyche from unnecessary wants and pay attention to our true needs. We can stop distracting ourselves with myriad things that turns life into a burdensome mess, and instead dedicate ourselves only on what makes it a worth-living adventure. In short, we can live a life that’s filled with purpose and meaning. Love is way more than exciting romance. Nearly everybody likes talking highly of love, but only a few are truly loving and satisfied with their relationships. That’s because most people have a wrong impression of what love is. In order to build a healthy relationship, two partners need to spend intimate time together. By doing so, they can deeply get to know each other and see how well they feel in each other’s presence on a day-to-day basis. Then and only then can they find out if they truly match, and therefore if it’s worth continuing their relationship. Bruce Lee saw life as an ongoing journey to wisdom: Through our everyday experiences, we get to better understand who we are and the world we live in, thus maturing as individuals. Life is fleeting, so we’d better make the most of it while we can, by fully immersing ourselves in it and doing whatever it takes to turn it into an amazing journey, no matter its ups and downs. Otherwise, what’s the point of living?